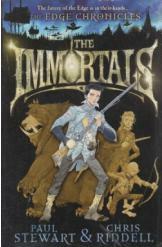 The Immortals by Paul Stewart and Chris Riddell, Sci Fi. Across the Edge, the goblin tribes are preparing for war. Nate Quarter flees for his life to the city of Great Glade, where he and his companions must learn the true history of the Edge before it is too late. Part of the "Edge Chronicles" series. Book is in good condition, all pages intact.